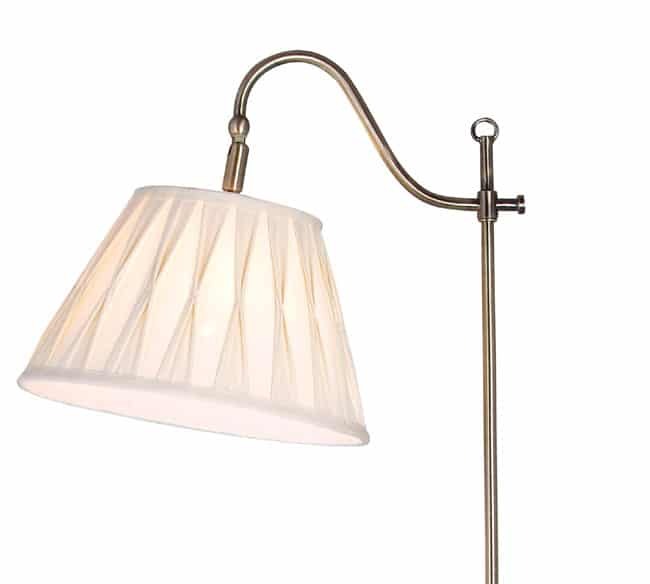 The Suffolk is a beautifully finished antique brass floor standard reading light that is adjustable not only in height, but also in the direction of the lamp shade. Fitted with an in-line foot operated on/off switch and class 2 double insulated, no earth required. Perfect for the traditional home and ideal behind the suite for reading by. When there’s 200 plus floor lamps for sale it makes sense to check out our complete range of floor lighting before making a choice. We’ve lamps in every conceivable style and finish to compliment your interior décor. Hello Lorna. Many thanks for your question. The Suffolk floor lamp has 2 meters of cable. Kindest regards, John.